Hearing the ryokan staff greet you with "Ohayo-gozaimsu!" ("Good morning!") cheerfully, you will become fully awake in time for breakfast. Taking a substantial morning meal at the start of a new day is considered very healthy in Japan, and you will find a sumptuous array of breakfast dishes on the table. Breakfast served at a ryokan is essentially washoku (Japanese food). 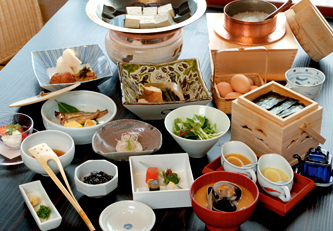 Some large ryokans serve breakfast in buffet style in a spacious dining hall, but it is still the norm to eat Japanese-style breakfast in the guestroom or at a restaurant. Steaming hot rice, miso soup, grilled fish, tofu dish, egg dish, nori (dried seaweed), and tsukudani (small fish and shellfish boiled down in soysauce and sugar) make up the standard Japanese-style breakfast. Prepared with pride by the ryokan staff, the dishes will stimulate your appetite. Together with the Westernization of eating habits, an increasing number of Japanese people today have bread and coffee for breakfast. Western-style breakfasts are also available at ryokans, although you should to inform your preference in advance. Breakfast in the guestroom Western-style breakfast also available.